Today we contemplate the beauty of Mary Immaculate. The Gospel, which narrates the episode of the Annunciation, helps us to understand what we celebrate, above all through the greeting of the angel. He addresses Mary with a word not easy to translate, which means "filled with grace", "created by grace", "full of grace" (Lk 1:28). Before calling her Mary, he calls her full of grace, and thus reveals the new name that God has given her and that suits her more than the name given to her by her parents. We also call it that, every Ave Maria. What does it mean full of grace? That Mary is full of the presence of God. And if she is entirely inhabited by God, there is no place in her for sin. It is an extraordinary thing, because everything in the world, unfortunately, is contaminated by evil. Each of us, looking inside, sees dark sides. Even the greatest saints were sinners and all the realities, even the most beautiful, are affected by evil: all except Mary. She is the only "green oasis" of humanity, the only uncontaminated, created immaculate to fully welcome, with her "yes", God who came into the world and thus began a new story. Every time we recognize her full of grace, we make her the biggest compliment, the same God made her. A nice compliment to be done to a lady is to say to her, politely, that shows a young age. When we say to Mary full of grace, in a certain sense we also tell her this, at the highest level. In fact, we always recognize her as young, because she has never aged from sin. There is only one thing that really does grow old, age inwardly: not age, but sin. Sin makes old, because it sclerotizes the heart. It closes it, makes it inert, it makes it fade. But the full of grace is empty of sin. Then it is always young, it is "younger than sin", it is "the youngest of mankind" (G. Bernanos, Diary of a country priest, II, 1988, p.195). Today the Church congratulates Mary by calling her all beautiful, tota pulchra. As his youth is not in age, so his beauty does not consist in exteriority. Mary, as the Gospel of today shows, does not excuse in appearance: from a simple family, she lived humbly in Nazareth, an almost unknown village. And it was not famous: even when the angel visited it no one knew it, that day there was no reporter there. Our Lady did not even have a comfortable life, but worries and fears: she was "very upset" (verse 29), says the Gospel, and when the angel "turned away from her" (verse 38), the problems increased. However, the full of grace has lived a beautiful life. What was his secret? We can catch it by looking again at the scene of the Annunciation. In many paintings, Mary is depicted sitting in front of the angel with a small book in her hand. This book is Scripture. Thus Mary used to listen to God and entertain oneself with him. The Word of God was her secret: close to her heart, she then took flesh in her womb. Remaining with God, in dialogue with him in every circumstance, Mary has made her life beautiful. Not the appearance, not what passes, but the heart focused on God makes life beautiful. Today we look with joy at the full of grace. Let us ask her to help us stay young, saying "no" to sin, and to live a beautiful life, saying "yes" to God. I greet with affection all of you, pilgrims present today, especially families and parish groups. I greet the confraternity and the athletes of Rocca di Papa, and the students of the Salesian Schools of Milan. On this feast of Mary Immaculate, the Italian Catholic Action lives the renewal of membership. I address my thoughts to his diocesan and parish associations, encouraging everyone to strengthen the formative commitment to be credible witnesses to the Gospel. May the Virgin bless Catholic Action and make her purpose fruitful to serve the evangelizing mission of the Church. 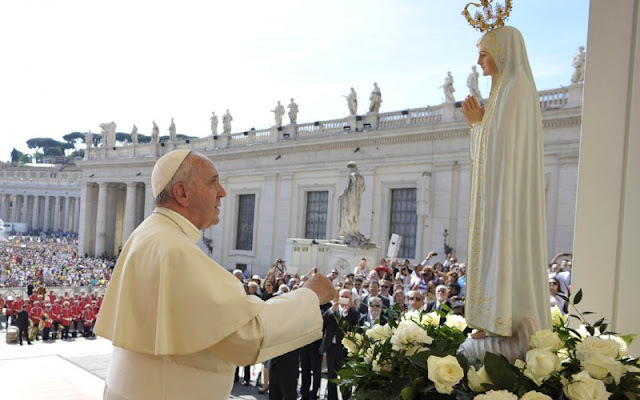 This afternoon I will go to Piazza di Spagna to renew the traditional act of homage and prayer at the foot of the monument to the Immaculate. I ask you to join me spiritually in this gesture, which expresses filial devotion to our heavenly Mother. All together, with the spirit, in front of the Madonna. I wish everyone happy party and a good Advent journey. Please do not forget to pray for me. Good lunch and goodbye!